Faces of Opioids hasn't added a story. Dead on the bathroom floor at work was all that went through my head when my best friend, Heather Jouget, died on May 6, 2017 of a heroin/fentanyl overdose. When very few people showed up for her funeral, I knew it was because heroin was tied to her death. Despite the fact she had worked for the state police for years as a dispatcher and commanded respect in that position, so many disassociated with Heather in her death. I felt there should never be shame in dying. I decided to start a Facebook group on June 11, 2017, that would show the faces and stories of people affected by the opioid epidemic. This organization shares the faces and the stories of opioid addiction. According to the CDC, at least 630,000 have died in the United States since 1999 from an overdose. We are putting a face to this opioid epidemic. Opioids, such as FENTANYL, are in every state, city, and suburb. The time for being complacent is gone! 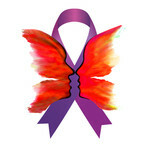 Join us as we fight this epidemic and break the stigma. One of the main projects of the organization is Little Faces which is a one of a kind program for children under the age of 18 who have lost a parent, sibling, or primary caretaker to the opioid epidemic. 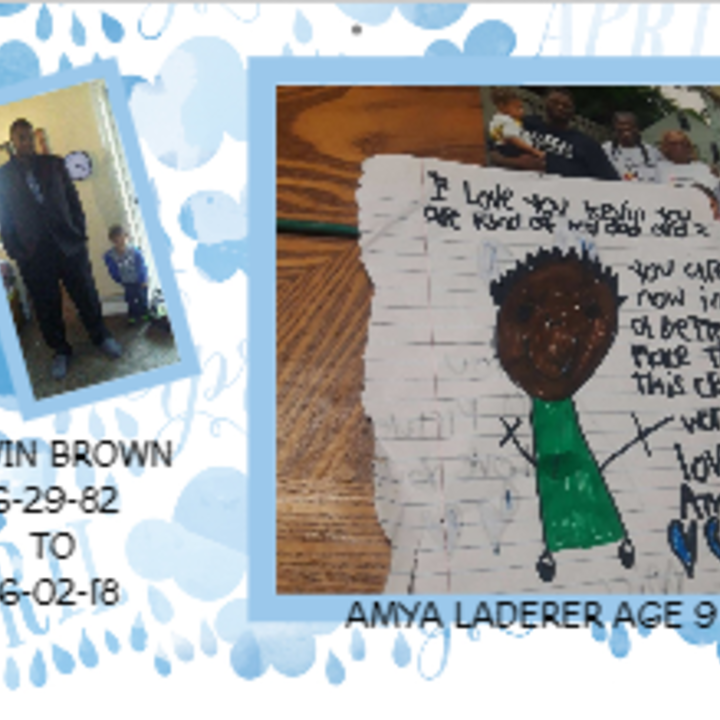 We provide each child a free memorial package, which includes a pillow made from the lost love one’s shirt or a stuffed animal, treats and cards throughout the year, and resource materials for the caregivers on grief and addiction. We raise money in order to make this a free service for the families and that is why we are asking for your help. We have over 300 children in our program that have enrolled since its inception in March 2018 and we do rounds of 40 children per round which is an estimated cost of $1300. We are also expanding our Little Faces program in 2019 to also adapt an education program that we can incorporate in schools and will be geared towards children that may have addiction already in their families. Our other large project is the Wall of Faces, which shows the faces of people in recovery, active use, and people we have lost to the opioid epidemic. Faces of Opioids is currently collecting photos for our Virtual Wall of Faces. In order to bring more awareness to the opioids epidemic, we are planning to display all of these photos in D.C. in 2019 with your help!! Our desire is to make this donor drive a success and obtain our goal so that we will not need to do additional fundraising in 2019 for our Little Faces program!! All donations can be deducted from your taxes and we will provide a tax receipt!! We are asking each active member of our organization to donate at least $2 and if each one does then we will exceed our goal of $30k raised. If this group has given you any support then we ask for you to please support us so we can conitnue our good works and spread awareness and support of this horrific epidemic. Faces of Opioids hasn't posted any updates yet. 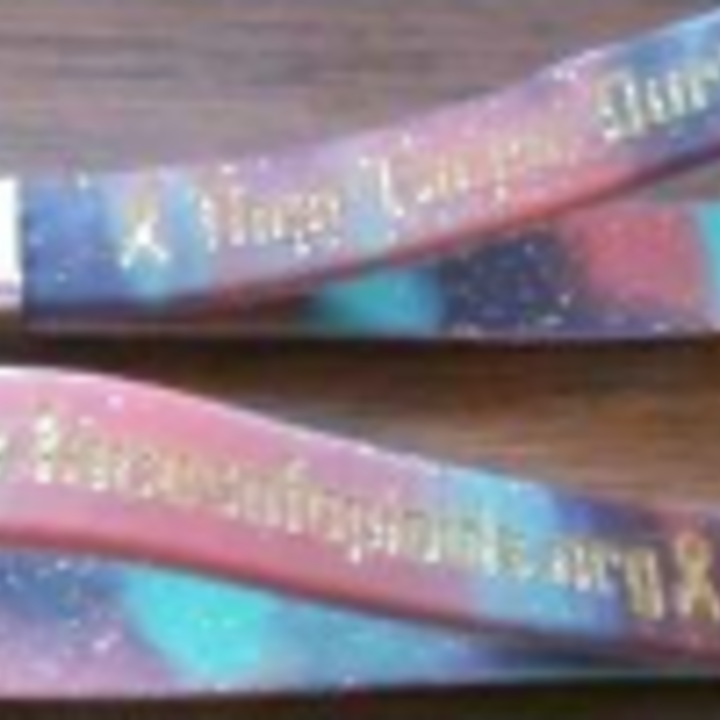 Our Bronze Donors will receive a Faces of Opioids' Bracelet and Keychain!! 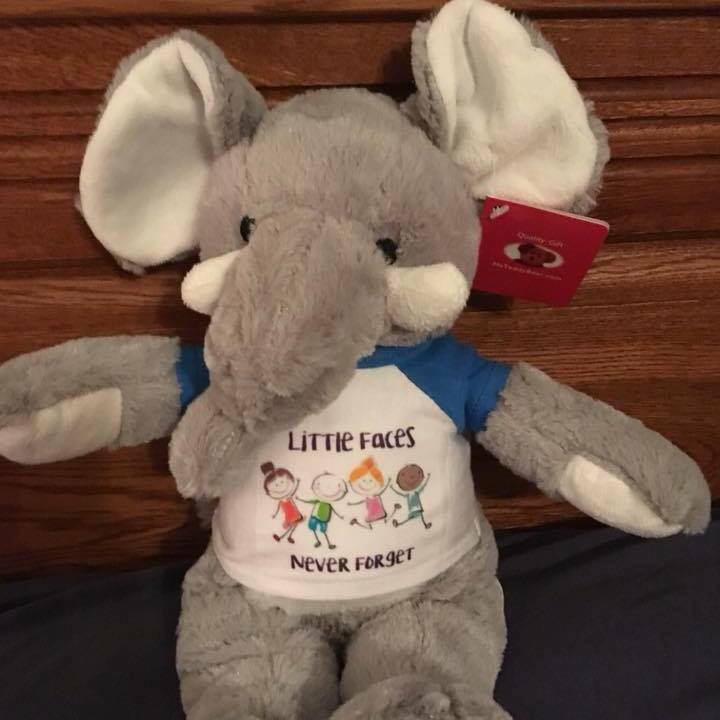 Silver Donors will receive a Faces of Opioids' Keychain and Bracelet and will receive a sponsor package which includes their own Little Face picture and special Little Faces Sponsor bracelet ;) This donation allows for us to ensure one child will receive their memorial package and treats throughout the year!! 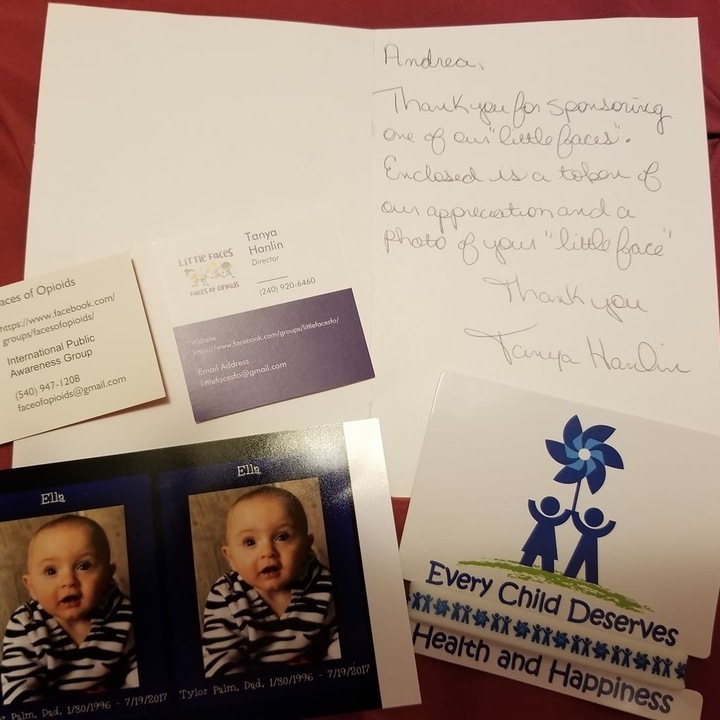 Gold Donors will receive a Faces of Opioids' Keychain and Bracelet and will receive a sponsor package which includes their own Little Face picture and special Little Faces Sponsor bracelet ;) This donation allows for us to ensure one child will receive their memorial package and treats throughout the year!! You will also receive a Little Faces 2019 calendar which includes artwork from our Little Faces as well as memorial pictures of our lost loved ones! Platinum Donors will receive a Faces of Opioids' Keychain and Bracelet and will receive a sponsor package which includes their own Little Face picture and special Little Faces Sponsor bracelet ;) This donation allows for us to ensure one child will receive their memorial package and treats throughout the year!! You will also receive a Little Faces 2019 calendar which includes artwork from our Little Faces as well as memorial pictures of our lost loved ones! This special donor will also receive our program only elephant mascot! Is our cause close to your heart? Join one of our social fundraising teams, or start a team of your own. Together we can make great things happen. Faces of Opioids is managing the funds for this campaign.